Disaster is an open-ended term. When disaster strikes at work, whether it affects 40 or 140,000 employees, you need to have a business plan. That’s what we recently chatted about with Michael Garza, business continuity consultant at Toyota, whose business resiliency experience is built on a graduate degree in occupational safety and a certification in Safety Management Systems. Basically, Michael is your go-to for what to do in a disaster. The things that all disasters have in common are a noticeable adverse impact to morale, performance, and the business atmosphere. How your company handles disaster is what makes it a place people trust. Michael suggests keeping three lessons in mind. “Communication would be the best strategy to employ when trying to mitigate the effects of a disaster,” Michael said. That includes stating what is known and what is unknown. But don’t make the common leadership mistake of feeling pressure to announce too much information. Especially in terms of hypothetical futures, Michael advised not to discuss things that could happen. “You want to stay on what you do know about the disaster and what’s not known at the present time,” Michael said. You should also tell employees what they should do and when to expect more information. Spend time communicating what’s expected now. Even beyond giving correct and helpful information, businesses should also listen. “The most essential part of communication is listening,” Michael said. “Listening to what the communication gaps are out there, what employees are reacting to, what are they prioritizing,” he explained. Knowing what your people are saying–whether their worries or their helpful ideas–is a key aspect of handling a disaster, large or small. Investigate obtaining a pre-loss assessment. Which usually just means finding out where your city utility connection points are located on your properties. “That pre-loss assessment gives you at a quick glance the location of utilities, information on resources that you would need, a location of generators and fire protection equipment, and so on.” Michael said. If you have property in a location prone to frequent long-term power loss, you might want to invest in a backup generator, for example. 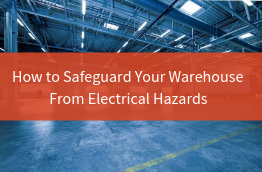 Otherwise, you’d still know where your electrical utility connections are and knowing that you’ll eventually have to rent a generator. Then you could even find out the capacity of generator you’d need, where it should be placed, how to connect it safely. The pre-loss assessment just gives you a heads up on how to plan so you don’t have to scramble after the disaster happens. How do you go about securing your assets, your equipment, and your facilities? On the physical security side, you’ll need to focus on the existing work agreement with your current security company. 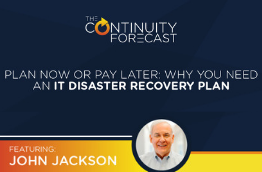 “Reach out to your existing security firm and ask them to provide a service continuity plan or agreement,” Michael suggested. Will they be able to prioritize your site based on a regional event? Will they have the right number of security staff present for your facility? What especially needs to be protected in an out-of-the-ordinary situation? What measures will be taken to keep the security staff safe? Find out what service they’re prepared to provide if your organization were impacted by some type of adverse event. You could also consider a backup service that can meet staffing needs for security if your primary isn’t satisfactory. “It’s a lot to think about, but definitely worth the time and effort to preplan all of this rather than going to security after the fact and to negotiate their presence on your site,” Michael said. Not all disasters are natural disasters, but plenty are. Sometimes you partner with other companies or organizations to handle the situation. “We reached out to the American Red Cross [during Hurricane Maria last year] and said, Hey, what type of resources do you need?” Michael said. They needed transportation for the disaster relief supplies and people. Toyota, as a vehicle manufacturer, was able to provide a fleet of pickup trucks. “Any type of resources that can be bartered or exchanged, really gets you to that table of assistance and support,” he said. What Toyota did as an organization to respond to and recover from the effects of Hurricane Maria in Puerto Rico is an example of trying to get good outcomes from a devastating situation. Dealing with loss of life far more than loss of revenue certainly underscores the value of taking as many precautions as you can when storms or other disasters strike. Businesses really need to do their homework to prepare an effective communication strategy, a pre-disaster plan, and ways to facilitate emergency aid. “Think realistically about the recovery pace setting,” Michael said. That means a realistic recovery or return to operations goal that works for the organization and doesn’t impose severe stress on the effort of recovery. Don’t arbitrarily say you want to recover operations in 48 hour without really knowing the specifics of the details of the impact. That’s like saying you’ll recover instantly, which probably isn’t feasible. “You really have to work through your plans and then plan, plan, and then plan again for the inevitable,” Michael said. Pace recovery, be patient, and take care of the essentials–people, families, and basic needs. The hurricane in Puerto Rico showed this truth: “It’s really about people. It’s really about making sure everyone’s okay,” Michael said. Contact Michael Garza on his LinkedIn account or at his work email: Michael.Garza@Toyota.com. He’ll also be presenting at the Disaster Recovery Journal (DRJ), so you can hear him speak more about Toyota there. 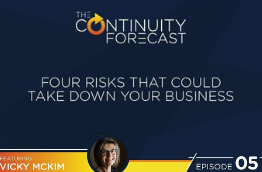 For more Continuity Forecast podcasts, subscribe to our channel on iTunes or your favorite podcast player.